It is often remarked that death knows no hierarchy: born naked, die naked. Yet how the living transform death’s meaning. Understandably when tragedy strikes we stand emotionally and physically alongside the bereaved as they mourn their loved ones. In the aftermath of multiple deaths the intensity is collective. The randomness of disasters, of who survives – who perishes, reminds us that it could have been me, my brother or sister, my mother or father, my son or daughter, my friend or neighbour. Towns, cities, villages become forever blighted by the deep sadness associated with their names. Throughout the year, particularly in summer, the sands of Morecombe Bay, to the west of Lancashire’s coastline and the south of Cumbria’s beautiful Lake District, attract thousands of walkers. The most famous Morecambe Bay walk crosses the mouth of the River Kent, from Arnside to Kent’s Bank. Guides understand the complex movement of the tides and the channels they weave between and within the ever-shifting sand banks. What attracts walkers – the miles of flat sand against the backdrop of the northern mountains, the desolation and openness – is also its inherent, seemingly benign, danger. On Merseyside, an hour’s drive south, the men and women hot-bedded in overcrowded houses. The beds were never empty, their occupancy dictated by the tides on Morecambe Bay. They were migrant workers mainly from China’s Fujian Province trafficked to Britain in search of a better life that would support those back home. Most had worked in Norfolk’s farms before being shipped north to pick cockles in Morecambe Bay: no papers, no citizenship, no status. Wages were barely enough to cover rent, food and the occasional phone home – calls of reassurance given the sacrifices made to afford the cost of illicit travel to the promised land. On 5 February 2004, the sea’s coldest month of the year, their backs aching and hands frozen some 40 men and women were caught in the tides. Desperate phone calls were made, their last, to relatives across the globe as they were overwhelmed by the inrushing tide. There were 15 survivors and 23 died. Victims of illegal exploitation, the product of their labour was sold to well-known supermarkets and restaurants, demonstrating that ‘fair trade’ is a local as well as international issue. In the immediate aftermath a former student of mine, Julia Hodson then Assistant Chief Constable of Lancashire, commented that the gang masters were: “criminals of the worst possible kind, that are prepared to exploit those that are the most vulnerable in our communities”. Without doubt, but those who bought the cockles never questioned their origin and their customers were reassured that their money was being spent on ‘local produce’. Standing on the summit of Grisedale Pike I look down from the mountain across the distant, wide sands of Morecombe Bay. It is low tide, the sea out towards the horizon, the sun glinting the small pools left behind. Walkers will be making the most of the clear, bracing day. I think back to the dreadful loss of life in a place so tranquil. I can’t free myself from the notion of death’s hierarchy. Given the loss of life, the pain and suffering inflicted on so many families, why has the tragedy not reached the national consciousness? Why does Morecambe Bay not feature in the list of disasters annually memorialised? What compensation did poor relatives receive? How do you compensate? The cockle-pickers from the Fujian Province are as invisible now as they were then … not us, not our people, not our loss … outsiders, outlaws, forgotten. In this spirit Kevin Littlewood wrote the song, On Morecambe Bay: “When I heard about the tragedy, it struck a personal chord. It was something that was drilled in to me from a very early age. My mother was always telling me that there was ‘the devil of a tide’ there … I wrote the song in solidarity with all those who live and work along this coast”. And Christy Moore, with Declan Sinnott, has recorded it on his new album. Phil lives in Belfast and is Professor of Criminology at Queen’s University Law School – committed to exploring the impact on identity and community of the politics and regulation of space: from prison cell to neighbourhood, from street pavement to mountain crag, from local playground to national park, from township/ reservation to gated real estate. This entry was posted in Memory, Music, Places on March 29, 2012 by Paul Scraton. Enjoying your posts regularly; don’t remember how I got here, but it’s worth it. Exploitation seems to the current and next stage of our political system. Here in the US democracy is a shadow of its former self. We seem to live for the sole purpose of enriching others. Someone sent me the link, and now I’m hooked on your site… Excellent! This piece got me thinking again about the event. The lack of any sort of ‘national’ response threw me when it happened, and helped spur me to write the song. I wonder if the reaction would be different today, 8 years on, with Twitter and so on? (Although one person emailed me the other day asking me if I’d made the story up). PS, here’s a link to the ‘director’s cut’ if you haven’t already got it……. What happened to the families of the drowned cocklepickers of Morecambe Bay? On the three-hour bus trip from the southern port city of Xiamen to central Fujian province, you move into a landscape of largely abandoned villages, once the homes of so many departed Chinese migrants. Here, around Fuzhou and the counties of Lianjiang, Changle, Fuqing and Putian, tens of thousands of villagers have left in the past three decades, driven away by low agricultural incomes and land developments that left them without compensation or livelihood. Seeking new ways to survive, they headed in waves for Japan, the US and Europe, including the UK. These villages, mainly occupied by the elderly, contain a mixture of old, shabby farmhouses and new mansions, built with money sent home by undocumentedmigrant workers toiling in sweatshop factories, restaurants, takeaways and building sites. 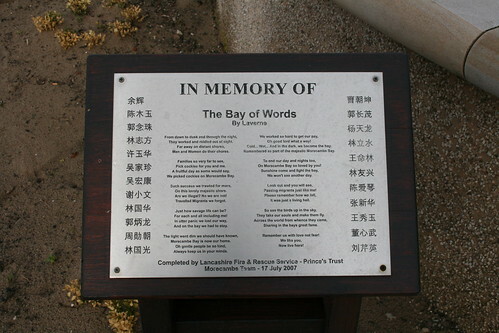 They are also the hometowns of the cocklepickers who drowned at Morecambe Bay in 2004. More than 40 Chinese workers were picking cockles there in the evening of 5 February 2004, sent by their recruiter and manager, Ah Ren, who was facing fierce competition from other Chinese teams along the Bay. To maximise profits, Ah Ren cut out the local middleman and gangmaster who bought cockles from him and controlled the production. That meant working against tidal charts and safety rules, which no one in the supply chain cared about as far as “foreign workers” were concerned. At 8.30pm, two hours after they should have been told to leave the Bay, the workers realised the tide had come up too fast for them to escape. They were stranded between deep, water-filled gullies. With no sign of rescue, the workers began calling their families. They cried, and said goodbye. Some drowned before their families could call back. The bodies of 21 men and women, aged 18 to 45, were recovered from the Bay in the days that followed. The 22nd, Liu Qinying, wasn’t found until autumn 2010. One was never found. All but one of the victims were from Fujian. Their families lost husbands, wives and parents, and were left owing mountains of debt to moneylenders. I reported on the tragedy at the time and researched the background to the exploitation of Chinese migrant workers. After exchanging phone calls and letters with these families for several years, and helping to raise money to pay off their debts, I went to meet them. In the Jiangkou township of Putian, I found Liying, the sister of Xu Yuhua, who drowned in Morecambe Bay with his wife Liu Qinying. Liying looked frail and worn out, but was strong in spirit, as she had been in her letters and phone calls. She had supported her orphaned nephew, Xu Bin, with the income from her job as an assistant to an overseas Chinese businessman. In fact, the whole family’s livelihood – her father, sister, daughter and unemployed husband – depended on her. Xu Bin had studied hard and passed the university extrance exam. He wanted to fulfill his parents’ ambition for him, and was planning to go to Britain to further his studies before building a career back home. The burden of debt after Zhifang’s death meant his younger brother had to work in the factory rather than go to university. Zhifang’s mother couldn’t speak much Mandarin but listened intently, and asked her husband to translate what she wanted to say. Several times she looked down, remembering the loss of her son, and wept. Zhifang’s parents seemed to have swallowed the pain of losing their son in such a modest way, as if misfortunes were inevitable for those born into the life of peasants. They had moved on and toiled away for the little cash that would keep them from starving. Their endless strength was humbling. Liying and I then travelled to the outskirts of Fuzhou to see Yan Chun, the widow of Dong Xin Wu, who was 39 when he drowned. He had been a cobbler in Fuzhou and migrated to the UK to work for his family. Yan Chun lives in a village with her mother and mother-in-law, who suffers from dementia, and lives on state support of only 150 yuan (£15) a month. The cost of medication has been a huge burden, even after a medical insurance system was introduced: “It’s a joke. Patients can only claim insurance if they are hospitalised, and then only 20% of the costs,” a neighbour who helps look after Dong’s mother told me. Yan Chun works as a cleaner in an insurance company, earning up to £80 a month. Her son had wanted to serve in the army in Tibet, where he could earn 100,000 yuan and help clear the family’s debts. (Most of the army in Tibet and Xinjiang, the “troubled regions”, are recruited from the impoverished countryside.) But Yan Chun wouldn’t let him go. She said she didn’t want to lose him as well. For the widows and families of the drowned workers, the future of the next generation has always been the overriding consideration. Yet it is hard to see what chance of a secure livelihood their children have in Fujian – and China. Fujian has always lagged behind the country as a whole; under Mao, the province was much neglected and received less than 2% of the nation’s capital investment. Agriculture was the mainstay, but less than 10% of the province was arable. In the late 70s, before Deng Xiaoping’s reforms, Fujian was ranked 23rd of 29 provinces in GDP. Since then, although poverty has been reduced, development initiatives have been concentrated in coastal cities such as Xiamen, while much of the countryside remains neglected and open to random land appropriation by developers. What’s left for the youth? As Liying and others kept saying: “There are few real jobs around here.” In villages and townships, the main work options are in low-paid manufacturing and service industries. Even with a university education, jobs in the public sector are difficult to get: connections are the key. When Jinyun’s family had finally paid off its debts, she borrowed money and sent both her sons to study in Japan, where course fees are half those in the UK, to study and work in the catering trade. Her younger son met a Fujianese woman and got married. However, their plans were interrupted by the 2011 earthquake and tsunami – Jinyun was anxious and asked them to return to China. Now her younger son is working for a relative in the timber business; her elder son is jobless. The desire for betterment still motivates many Fujianese to migrate. Today, the immigration cap on non-EU migrants has closed off legitimate routes, while the strengthening of the EU’s border controls has made overland smuggling even more expensive. Given all this, many Fujianese parents look for other ways to send their children to Britain, often as students or asylum-seeking orphans. Those who come as orphans are among Britain’s most vulnerable young migrants. They leave home for the first time and arrive in a country they know little about as unaccompanied minors. They then claim asylum and are put into social care. Some may be granted refugee status; others disappear into the informal economy, where they tend to work in the lowest-paid jobs in catering and service industries and are exploited – just like their predecessors. When I look at these young men and women, I remember the tanned faces of the workers, kneeling down to rake the shiny black cockles under the sun and rain, in order to send money home.